Setting aside last weekend's subzero temperatures, there's some irony in exhibiting ice-fishing shanties during one of Vermont's warmest winters. Still, the outdoor show "Arctictecture" at the Shelburne Museum promises fun. Assistant curator Carolyn Bauer, a Wisconsin native whose father ice fishes, asked five local architecture firms to design and build their own versions of the ice shanty — the portable structure that fishermen and -women use to block the wind while waiting on the ice for fish to bite. For many Vermonters who pursue the sport, a pup tent (or less) is sufficient for the job. But offering architects the chance to experiment within a simple, functional rubric, without the pressure of a client's demands, was like giving candy to a child. 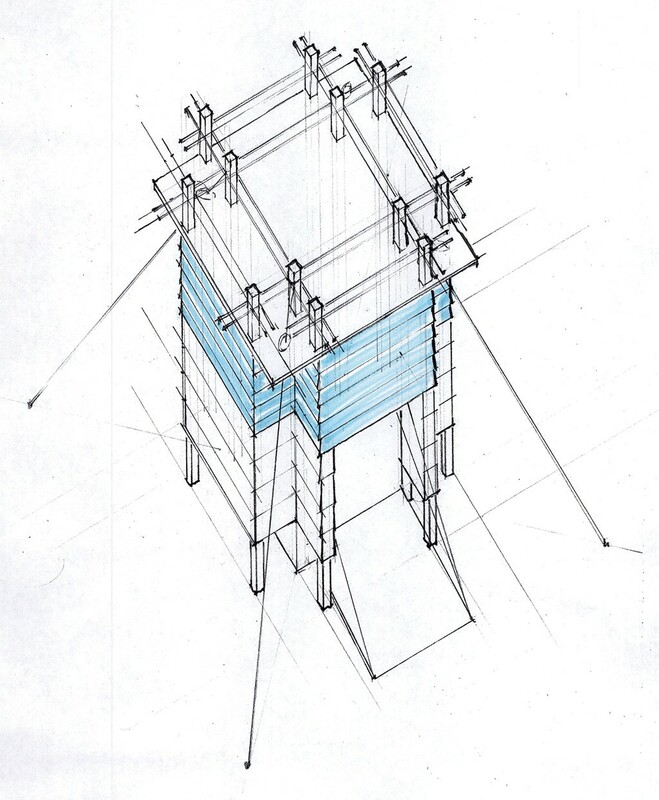 Each firm was granted a modest stipend and just one parameter: The structure must fit on a trailer. TruexCullins in Burlington, Peregrine Design/Build in South Burlington, and the Shelburne firms Pill-Maharam Architects, S2 Architecture and Selin + Selin Architecture have pulled out all the stops: 3D modeling, scale models, material spec sheets. Many of their shanties have not yet been built. (Sited on the grounds in front of the Pizzagalli Center for Art and Education building, they will open to the public on February 27.) But the plans and sketches reveal a wildly imaginative range of approaches. One could have a small fishing party in Peregrine's shanty, which seems the most practical of the bunch, and the nearest to completion. Conceptualized by architectural designer Cliff Deetjen, who has ice fished on North Hero's bays this winter, the structure is like a large shed on runners. Secured to the sloping roof is a seeming jumble of thick insulation-board pieces clad in silver foil. Echoing that sculptural aesthetic, built-in interior benches cut through the walls to angular extensions outside. Deetjen says the angled and bisecting planes were inspired by hunks of ice hefted atop each other during storms. The shanty's Plexiglas windows provide angled views of such icescapes. The door caps the evident craft of this structure, on which all 18 Peregrine employees collaborated. A curving fishtail emerges from a slot in the door's window; its handle resembles a large fishhook. David Pill, of Pill-Maharam, thought of ice cubes in a more abstract sense when he first contemplated the project, he says in an interview. At first glance, Pill's shanty looks like a sleek, impenetrable museum piece: a perfect modernist cube with reflective glass walls set in chamfered wood frames. The door is actually one of the four walls, pivoting on centered pins. Pill says he intends the ice-cube shape to remind viewers of the ephemerality of ice in temperatures above the show's eponymous 32 degrees and, by extension, of the danger of winter's disappearance as the globe warms. Outside, the one-way glass reflects that changing landscape; stepping inside, visitors can privately contemplate the same while remaining unseen. "Most of my work is focused on sustainability and energy efficiency," explains Pill, whose work includes passive houses. He could have insulated the cube, he adds, but it wasn't meant as a practical take on ice shanties. That's not to say he didn't do his research. "I studied a lot of images of ice shanties," says Pill, a non-fisher. "Some have woodstoves and insulated floors; others are made from found materials. It's a great vernacular." The married team Selin + Selin will surely add to that vernacular with their pair of Nordic church-inspired shanties. Colorful stained glass accents all four sides, and pitched roofs are made of translucent, prismatic sheeting. These are single-person shanties. Architect Steve Selin and illustrator Judith Selin focused on the dual social nature of ice fishing, a solitary pursuit that often creates its own community. The shanties' arched, church-like doors face each other in one rendering. And the structures will glow around the clock, aided by the prismatic material in daylight and by solar panels with a battery connected to LED lights at night. Steve Schenker, sole principal of S2, saw the shanty as an opportunity to design something sculptural. He settled on a cruciform plan, formed by three benches and a doorway bay. A builder, working in his garage, is currently constructing the structure's grid of posts, which supports a rooftop snow trellis, says Schenker. 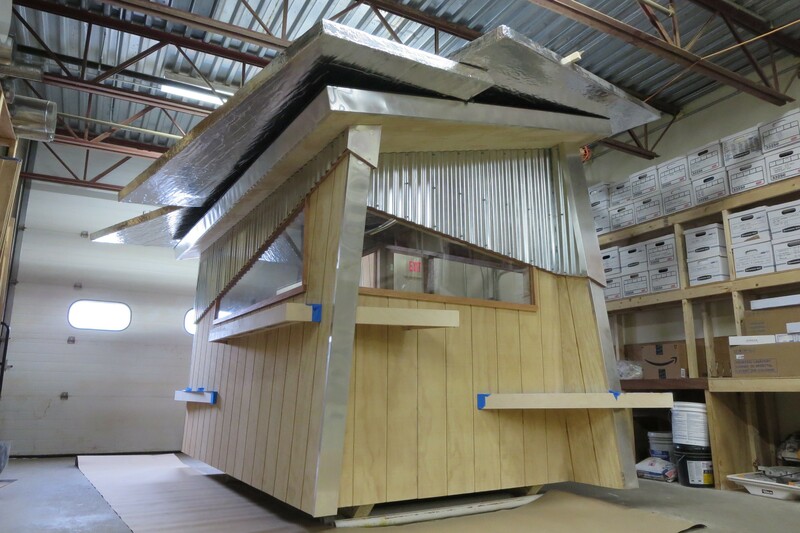 At TruexCullins, architect Rolf Kielman and his next-gen cohort — designers Joshua Chafe, Andrew Chardain and Keith Nelson — sought to make their shanty erectable by "nonskilled labor like us," as the four joke during a conference call. They settled on a shanty made almost entirely of readily available plywood custom-cut by a CNC router. The pieces will come ready to assemble, rather than to build. The shanty's visual impact is strong nonetheless: an iceberg-like trapezoidal form with a triangular roof and crossed-rib cladding on the walls. The designers toyed with several ways of attaching the ribs to the skin without nails or screws and finally came up with a system of holes and shoelaces. "Now we actually have to build it," admits Chafe in an email. Bauer, who devised the shanty part of "32 Degrees: The Art of Winter" to get visitors outside, says she thought she'd be nervous creating an exhibit out of not-yet-realized work for her first solo-curated show. Now she's excited. Would her father, the fisherman, take one of these shanties out? "He fishes with no protection; he just sits on a bucket on the ice," Bauer says. Given how well made the architects' shanties are, she adds, "he would be maybe too distracted." What Do Glaciers Sound Like?